New for Fall 2016, Dainese has just announced the Misano Leather Pants as a step up from their Delta Pro C2 Perforated Leather Pants. 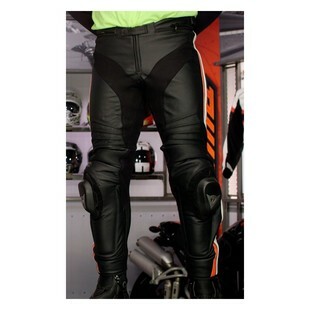 These new Dainese Misano Pants set a new standard for track-level performance for sport riders on or off the track. Dainese already knew they had a great product with the Delta Pro C2 Perforated Leather Pants, so the new Misano pants can be considered an evolution rather than a revolution. The biggest change is going to be the D-Skin 2.0 leather that is taken straight from the D-Air Misano Race Suit. Like the race suit, the Misano pants come with a Nanofeel liner with Silver ion anti-bacterial treatment and a pant-to-boot fastening system that works with all Dainese -In Boots. The big news is that these pants are fully CE-Certified according to current standards, and come with CE-Level 2 knee armor and CE-Level 1 hip armor. Last but not least, Dainese increased the amount of elasticated material around the inside of the pant legs and on the back of the Misano pants. This will give greater range of motion on the bike, and will help with jacket fitment when a Dainese jacket is paired with these pants. All things considered, the new Dainese Misano Leather pants are the top dog in Dainese's pant lineup. By taking all the best parts from the bottom half of a Misano suit, Dainese has created a pair of track-level pants that outperform the competition. So, whether you're hitting your local track, or dragging a knee in on your favorite canyon road, the new Misano Leather pants have you covered.